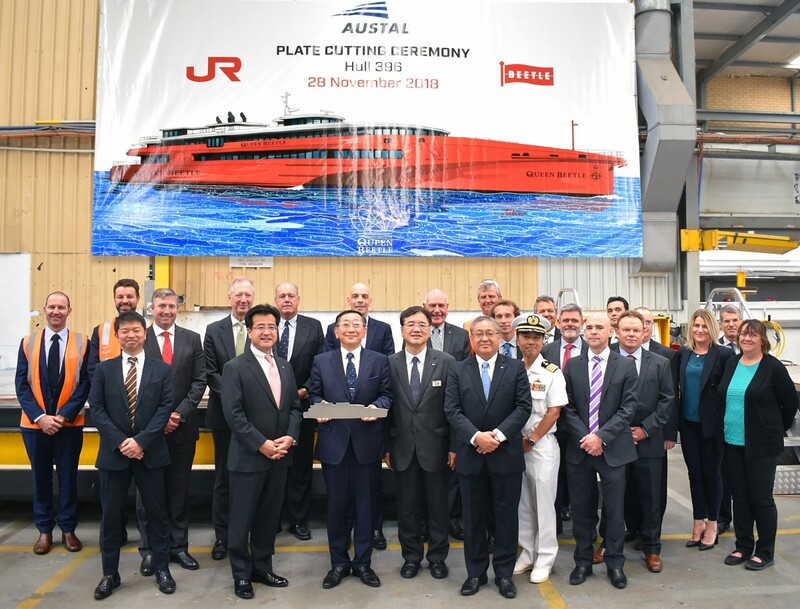 AUSTAL (ASX: ASB) has commenced construction on a next generation 83 meter trimaran ferry for JR Kyushu of Japan at its shipyard in Western Australia. This trimaran vessel was developed in Henderson, Western Australia at Austal’s centre of excellence in maritime design. “The Austal trimaran’s unique hull design is revolutionising the commercial and defence vessel markets for high speed ships where performance, speed and sea keeping are at a premium. This vessel configuration was first developed by Austal and has been shown to reduce sea sickness in heavy seas by around 80%. As a result the trimaran hull form is becoming increasingly popular with the high speed passenger ferry industry.” Austal CEO, David Singleton said. “We are particularly pleased to be building a ship in Australia for export to Japan, a country which has a world class shipbuilding industry of its own and to a customer with such a high profile in passenger transport as JR Kyushu. It is hard to imagine a better endorsement of the vessel design and capability than to be able to sell into such a discerning market as Japan. The vessel will be in service between South Korea and Japan in time for the 2020 summer Olympics. With 11 Austal trimarans already in operation around the world, another 8 under construction and a further 5 on order, it’s fair to say we are seeing a transformation in the market,” he said. The 83 metre trimaran, with a capacity for 502 passengers and an operational speed of 37 knots, will service JR Kyushu Jet Ferry’s key strategic route between Fukuoka, Japan and Busan, South Korea. The vessel will feature a very high quality customised interior, developed by respected Japanese design house, Don Design Associates, led by Mr Eiji Mitooka, famous for the luxuriously appointed interiors of JR Kyushu’s high-end passenger trains. Austal Australia welcomed distinguished guests including Mr Toshihiko Aoyagi, President and CEO of Kyushu Railway Company and Mr Masayuki Mizuno, President of JR Kyushu Jet Ferry Inc to the Henderson Western Australia shipyard, to celebrate the aluminium plate cutting for Hull 396, an 83 metre trimaran under construction for JR Kyushu Jet Ferry of Japan. The vessel, to be named Queen Beetle, will be operating between Japan and South Korea, prior to the commencement of the 2020 Olympics in Tokyo. Photo: Austal.